Justin hails from Wichita, KS and has been acting in theatre and film for the last 16 years. Some of his past professional credits include Acradia (Valentine Coverly), Heaven Can Wait (Tony Abbott), For the Love of Juliet! (Romeo), We Must Kill Toni (Francis Oberon) and The Radio Adventures of Trixie Trueheart: Girl Aviator (Tommy). 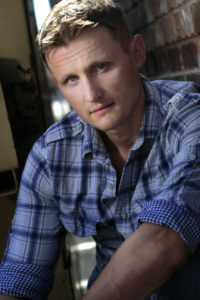 Justin’s film credits include the 2013 western noir feature Wichita, 2012 music video Complicated by Soulicit, and the 2011 short film Synesthesia. Since relocating to the Tulsa area, Justin has taken a step back from performing to write and direct. He recently directed The Craving for Owasso Community Theatre with performers ranging from the age of 13 to 30. Currently, he is in pre-production to direct multiple film projects in 2019 and 2020. Justin is really excited for this opportunity and to be a part of the Theatre Arts family. When not performing Justin enjoys playing music, reading, obsessing about New York Yankees baseball and spending time with his wife, three cats and pit bull.